I Love this bird!!! If I'm Honest it's a relationship which has had to grow, I loved what I saw other people using him for but seriously every time I looked at him I came up blank but he's grown on me, you'll have to check back to see what else I come up with. I love how you've done this card Abi, the worm is such a great touch! 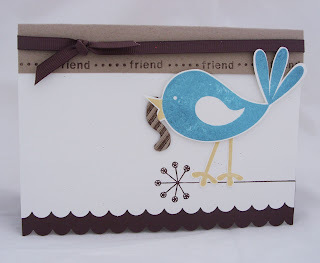 Aaww this is cute, I reckon you are gonna end up using this stamp a lot..
i love this blue bird and the worm is a great finishing touch!! !